Say goodbye to sports injury pain, back pain or arthritic pain! SEA Relief Lotion™ is a topical skinceutical that is ideal for muscle and joint pain management from overexertion or arthritic inflammation. This Lotion is a powerful medium that utilizes the healing power of your body’s largest organ – the skin – to restore vitality. It combines the life sustaining attributes of the vital mineral, magnesium with all the minerals naturally occurring in the pristine Okinawa ocean waters. This combination helps to boost magnesium absorption through the skin, bypassing the digestive system. This means no potential for digestive disturbances while the majority of the active ingredients go directly into the bloodstream, where they are quickly transported to the cells throughout the body, where they are needed most. The convenient flip-top cap allows for easy application to painful areas of the body where it has an almost immediate effect on pain. Whole body applications are also possible, to induce restful sleep and overall well-being. Sea Relief Lotion can be added to a hot bath for an enhanced therapeutic effect. The combination of heat and magnesium chloride increases circulation and waste removal, while drawing inflammation out of the muscles and joints. Magnesium is a vital trace element and is essential to the correct functioning of the body, but it is often the most deficient mineral in the body. Insufficient levels of magnesium may contribute to heart disease, high blood pressure, diabetes, asthma, osteoporosis and other disorders, as it is involved in supporting the health of nearly every cell in the body. 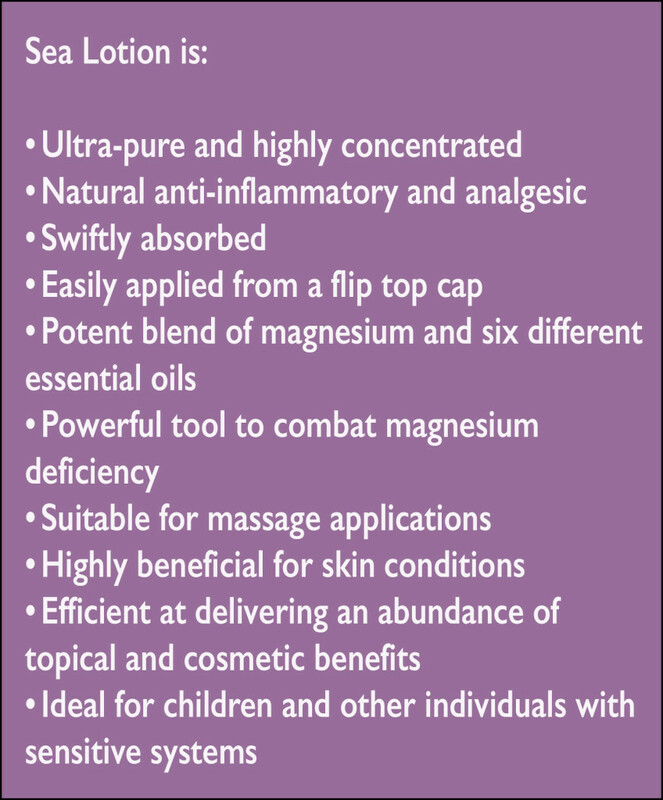 One teaspoon of Sea Relief Lotion™ contains around 525 mg of Magnesium – the highest concentration on the market. Sea Relief Lotion contains magnesium chloride, which is one of the most easily absorbed forms of the mineral. This transdermal magnesium supplement is designed to deliver high concentrations of magnesium through the skin, bypassing the gastrointestinal tract for convenient, rapid absorption into the cells. This is the most efficient delivery system and provides various benefits for health and pain management. 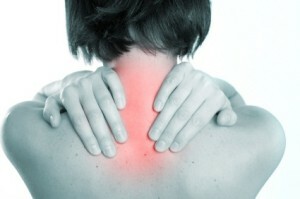 The principle intention is to reduce muscle pain, cramps and fatigue. Sea Relief Lotion works rapidly to deliver magnesium and other trace minerals through the skin and into the lymph and bloodstream, in order to reduce inflammation and encourage regeneration of tissues. Regular use may also help to increase flexibility, strength and endurance, by systematically removing accumulated calcium from the flexible tissues, of the body. Remissions in the clinical symptoms usually occur in six weeks to six months. In severe cases, where the joints have accumulated a great deal of misplaced calcium, it may take as much as a year to begin to feel observable differences. Further, once flexible tissue cells have expelled their excess calcium and replaced the excess with magnesium and other trace minerals there remains the task of rebuilding these tissues according to an improved form of magnesium/calcium balance. Here again the EssenceSEA product line offers supplements that will facilitate such rebuilding. Your distributor can direct you to programs that will help rebuild the physiology in a way that does not end up reproducing the old conditions. Dental: When strongly diluted and used as a mouthwash Sea Relief Lotion is excellent for the gums, teeth and gingivitis relief. It is magnesium, not calcium that helps form hard tooth enamel resistant to decay. Detoxification: For purposes of cellular detoxification and tissue purification, Sea Relief Lotion has a strong excretory effect on the toxic metals (including aluminum, mercury lead) that accumulate in the tissues of the body, It encourages the cells in the body to detoxify and cleanse themselves, drawing out impurities through the pores of the skin. Sports Performance: Sea Relief Lotion promotes good muscle health. As much as 25% of the bodies Magnesium is found in the muscles. Magnesium is a critical mineral especially when it comes to sports nutrition. During vigorous exercise, the body endures extra strain and vital minerals are lost through perspiration, the most important being magnesium. Adequate levels of magnesium will help the body fight against fatigue, heat exhaustion, and assists in blood sugar control and metabolism. Additionally, athletic endurance and strength performance are enhanced when a large amount of magnesium is supplemented topically and/or orally. Insufficient magnesium increases the amount of oxygen required to maintain ATP production. Magnesium used in conjunction with sports massage increases flexibility and muscle tone, and therefore reduces the risk of injury. Massaging with Sea Relief Lotion on a regular basis will assist with the body’s natural recovery process, thus reducing healing time as well as helping to prevent future injuries from sore and stiff muscles. General Application: Sea Relief Lotion should be applied topically. Dispense into the hand from the flip-top bottle, and then rub into the skin thoroughly. Repeat to cover arms, legs, or any areas requiring special attention. Reapply as needed. **A slight tingling sensation may occur. This is normal. In the event of discomfort, remove the excess with a wet cloth or shower. Therapeutic Bath: Put 4 tablespoons (2 liquid oz. or 60 cc) or more, of product into a hot bath. Soak in the hot bath for up to 30 minutes. This provides a relaxing soak that will allow the minerals to absorb through the skin and deliver them to the cells of the body. Repeated baths may lead to a strengthening of the bones, as the minerals include the appropriate amount of calcium, in a form that is easily converted to bone material. For Sponge Bath Applications: Put 1 ½ teaspoon (~7.5cc) of Sea Relief Lotion in a ¼ cup warm water. Apply this to the skin wherever muscle, joint or bone pains are experienced. This will supply around 2000 mg of high-magnesium ocean minerals into the body, once all of the liquid is absorbed through the skin. The magnesium will decrease the excessive pain sensitivity of the nerves and drive the calcium out of the affected areas. In some cases, many of the attachment points of the muscle to the bones, become inflamed and painful, even in the resting state when no exercise is being done (as in Fibromyalgia). In such cases, there can be value to doing daily sponge baths or more frequently, for several months, until such time as the condition becomes less painful. Volixer™ Water, high-magnesium concentrated selection of over 80 ocean minerals, dimethylsulfoxide (speeds up absorption), lavender oil, all activated by the Volixer™ technology. Disclaimer: Sea Relief Lotion is intended to mitigate muscle and joint discomfort from inflammation due to excess calcium in the flexible tissues and to soothe nerves with added magnesium and trace minerals. It has not been approved as a drug or medical program to cure, mitigate or prevent any disease and is not intended to replace appropriate care by your licensed medical practitioner.